This post says something about the origin of brainwaves and gives some information on their significance. A good description can be found at https://learn.sparkfun.com/tutorials/hackers-in-residence—hacking-mindwave-mobile. I make no excuses in this section being my own work, it has been direct from the quoted source. The 5 types of brainwaves measured and reported originate from different parts of the brain. They also have extremely low amplitudes and frequencies. Gamma waves are oscillating waves with frequencies around 40 Hz, although they can be as high as 100 Hz and as low as 24 Hz. 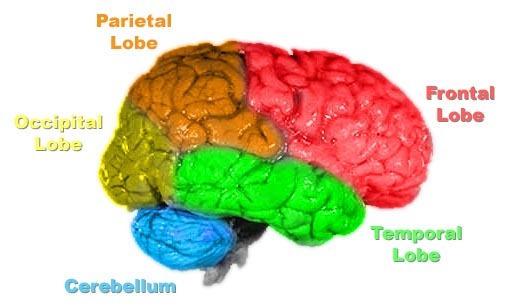 These originate from the thalamus (buried deep in the centre of the brain) and are responsible for states of high attention and concentration. 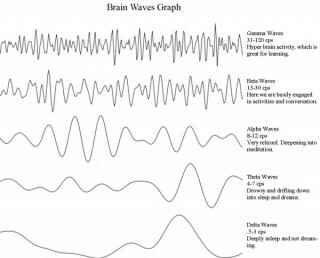 Beta waves are between 12 and 30 Hz and are the states associated with normal waking consciousness. These are emitted from the motor cortex, a region of the cerebral cortex, which is the outermost layer of tissue on the brain. Beta waves are split into three sections: Low Beta Waves (12.5-16 Hz, “Beta 1 power”); Beta Waves (16.5–20 Hz, “Beta 2 power”); and High Beta Waves (20.5-28 Hz, “Beta 3 power”). Alpha waves originate at the Occipital lobe and have a frequency of 8-12Hz. These are most present when you are awake but are very drowsy or relaxed. 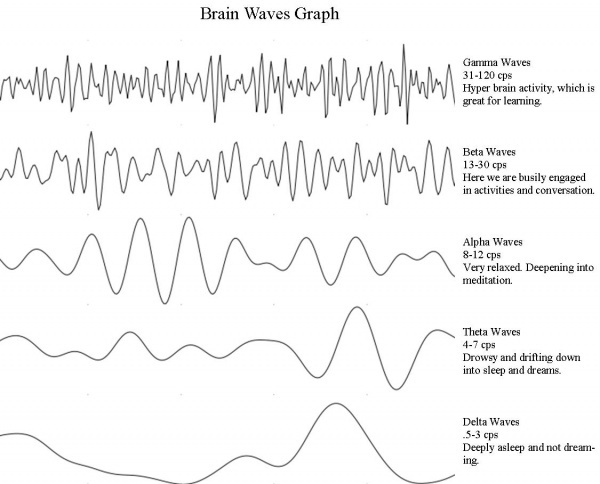 Theta waves are oscillating waves that are located in the Hippocampus and are associated with dreaming. They are in the 4-7Hz range. Delta waves are associated with very deep, dreamless sleep cycles and are high amplitude waves, which have a 0 to 3Hz frequency. These waves emit from both the thalamus and the cortex. The difference between these waves can be more easily understood when seen side-by-side. This is my last post on the BCI for the time, the write-up is up to date with my experiments. Future plans are to get the visualiser working on my Raspberry Pi, apparently it can be done. I also want to see if I can take the Arduino out of the equation and have the data from the XRF wireless module connect to the Rpi and work. I would also like to make a visual display from an array of multi-coloured LED’s connected direct to the Arduino, dispensing with the need for a host. Then there is the more complicated and delectate modification to Mode 2, to get the raw eeg data. These are really on the visualisation side, returning to the original game, the output of the TGAM1 is used to control a the fan speed. I would want to look at various control options, what could be and how to, probably based entirely on the Arduino, with maybe option to see the brain electrical activity at the same time. I will write up progress as and when, I’m not sure in what order I will tackle these ideas.